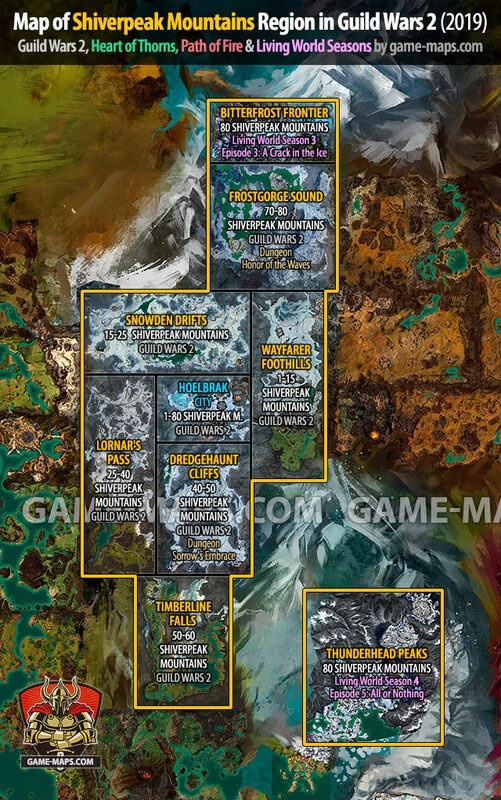 Atlas of fully discovered Maps (updated in 2019) for Guild Wars 2, GW2 Heart of Thorns, GW2 Path of Fire and Living World Seasons. 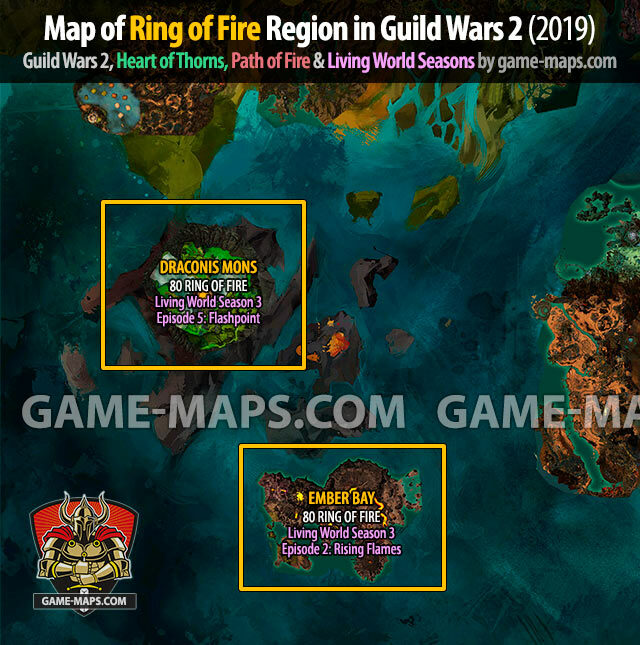 Maps of GW2 individual zones contain locations of Renown Hearts, Points of Interest, Waypoints, Hero Challenges, Vistas, Adventures, Jumping Puzzles, Maguuma | Path of Fire | Central Tyria Masteries, Dungeon Entrances. 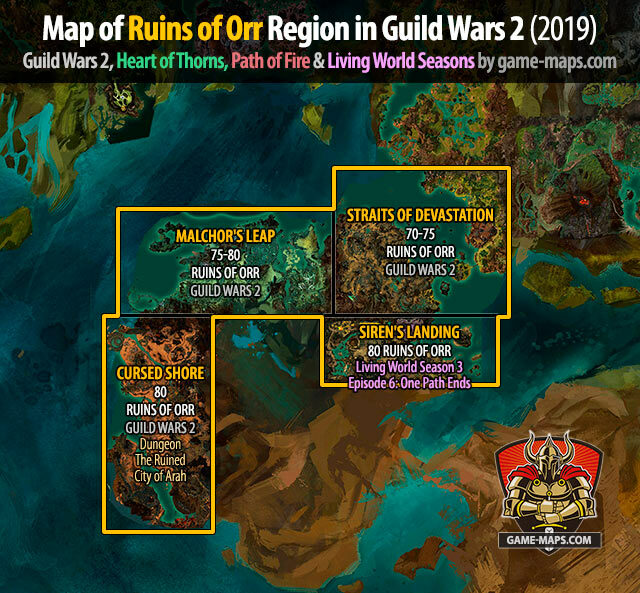 ATTENTION: At the moment I am in the process of updating maps to version of the game from 2019. 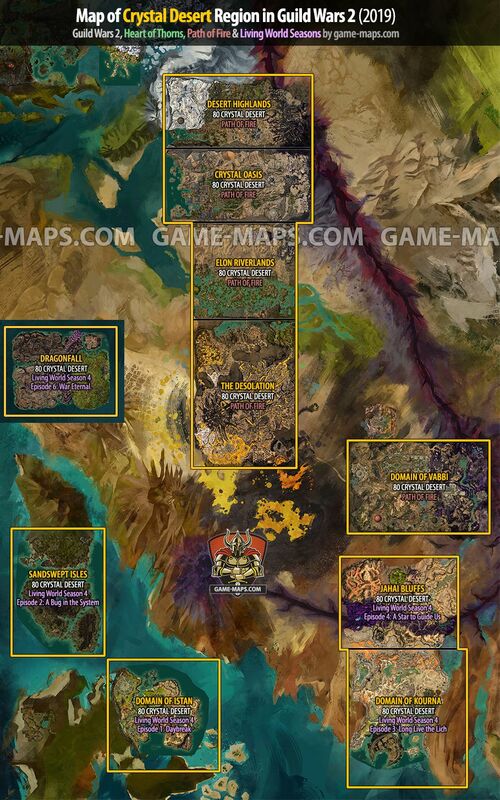 As of today, maps for the Kryta and Crystal Desert Regions have been updated, other maps are older. 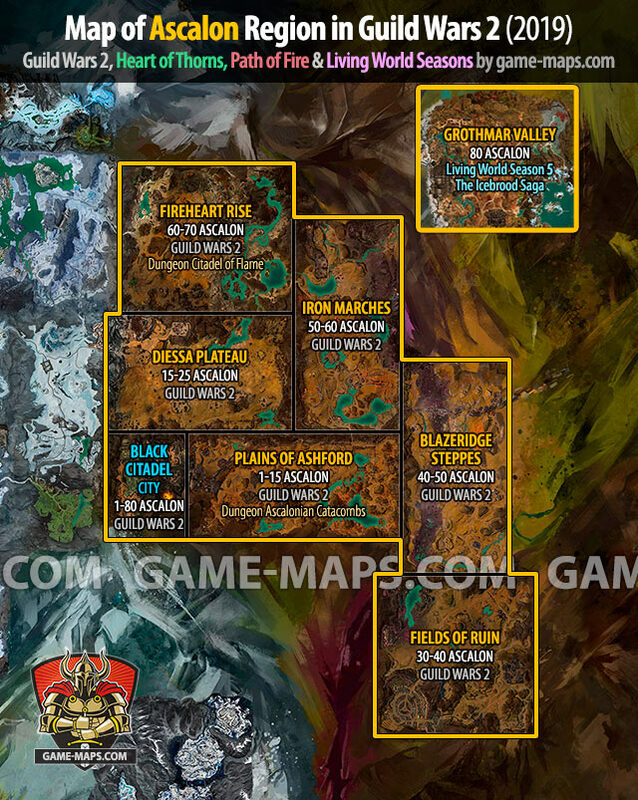 Ascalon, region of Tyria, is the domain of Iron Legion charr. 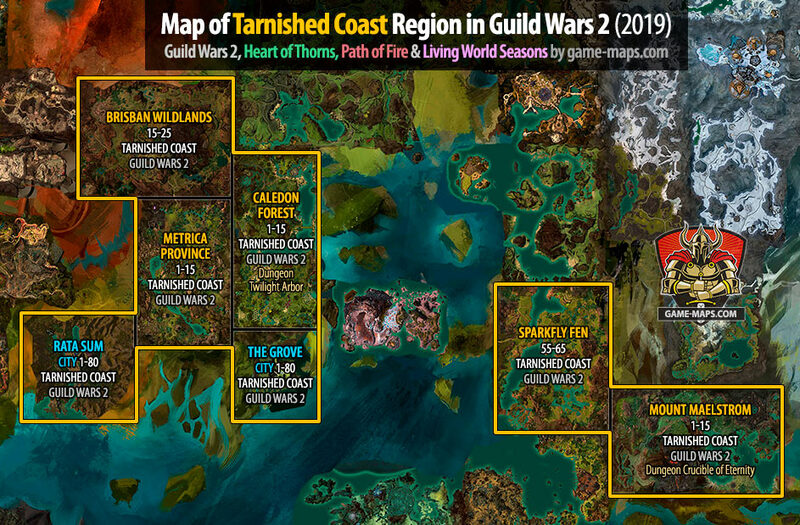 It is a temperate, moderately lush region that has been fought for by the charr and humans for centuries. The Shiverpeak Mountains, also simply called the Shiverpeaks, rise up over ten-thousand feet above sea level and is a vast mountain range spanning most of Tyria, running north to south and dividing it in two. Episode 5: All or Nothing. All of the peninsula is a vast and verdant jungle. While the wastes have completely dried and are uninhabitable, the Tarnished Coast has maintained its wildland of tropical trees. 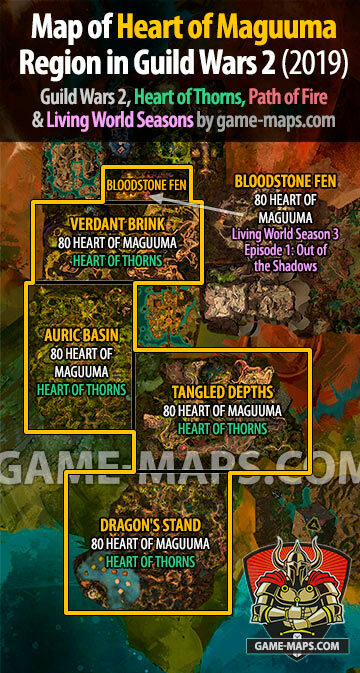 Heart of Maguuma is an area west of the Tarnished Coast, just beyond Rata Sum. It contains the thickest forested parts of the Maguuma Jungle and is the longtime home of the Quetzal tengu and Itzel hylek who still live there today. 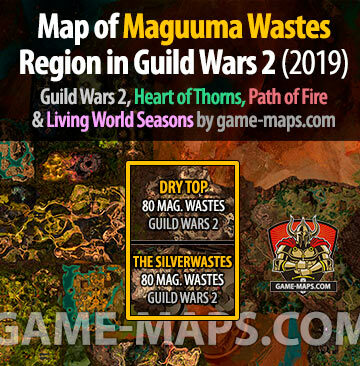 The Maguuma Wastes is the area north of the Tarnished Coast. They are formed from the portions of the Maguuma Jungle that have mysteriously dried out over the years. The Ring of Fire is a group of volcanic islands just south of the Tarnished Coast. The large volcano at the center of the ring, called Abaddon's Mouth, is where the Six Gods dropped the Bloodstones before leaving Tyria. 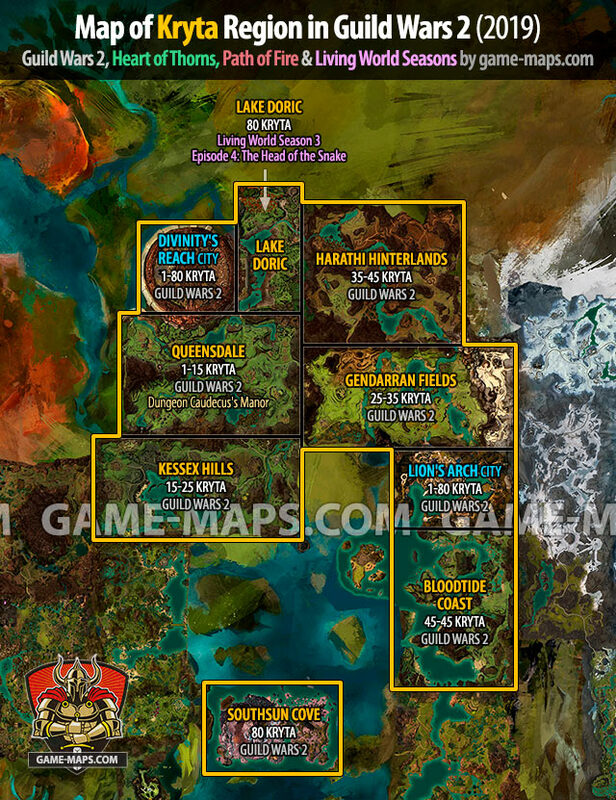 The Ruins of Orr are situated on a peninsula south of Ascalon and west of the Crystal Desert. They are the destroyed remains of one of the three Tyrian human kingdoms which was once a vibrant, proud, and prosperous nation. 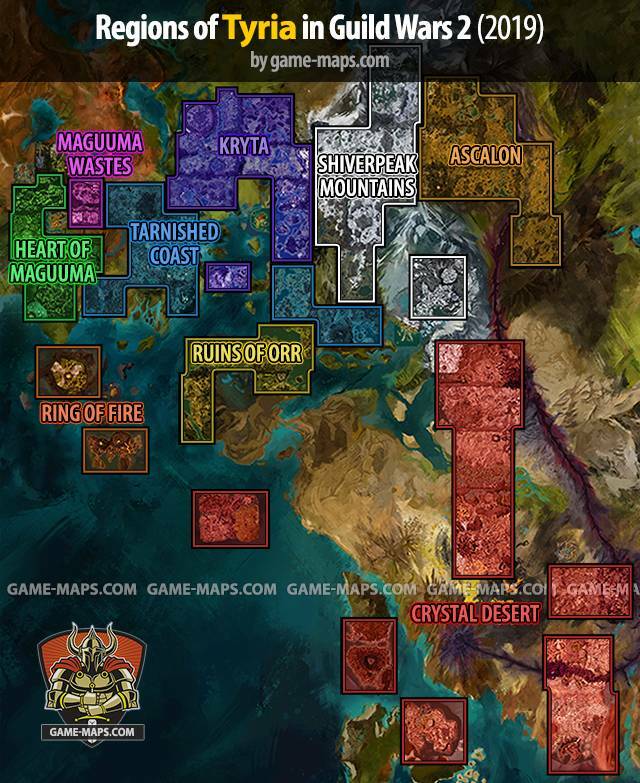 The Crystal Desert is the land that lies between the nations of Ascalon, Orr, and Elona. It is said that every grain of sand in the desert was in fact a tiny crystal, giving the region its name.